☢ Græsk: Grundstof med atomnummer 53 i det periodiske system. Detonationen af atomvåben, atomvåbenuheld og uheld på atom-kraftværker frigiver bl.a. jod-129 i miljøet. Atmosfæriske atomvåbenforsøg i den første del af den kolde krig har frigivet radioaktivt jod i atmosfæren, som har bredt sig som radioaktivt nedfald rundt om i verden, og er nu fundet i miljøet. Størstedelen af I-129 i miljøet kommer fra atomvåbenforsøg. 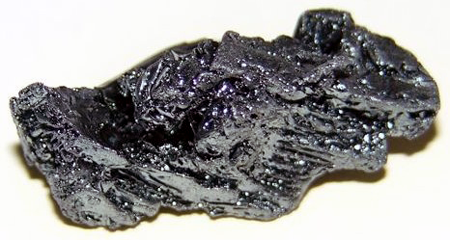 Barium ; beryllium ; cerium ; cæsium ; krypton ; lanthanum ; molybdæn ; neptunium ; niobium ; plutonium ; polonium ; radioaktivitet ; ruthenium ; strontium-90 ; tellur ; tritium ; uran ; xenon ; zirkonium. Argonne National Laboratory, EVS Human Health Fact Sheet, August 2005 Iodine. - 2 s.
Distribution and administration of potassium iodide in the event of a nuclear incident. National Research Council (U.S.). Committee to Assess the Distribution and Administration of Potassium Iodide in the Event of a Nuclear Incident National Academies Press, 2004 - 248 s.
National Institutes of Health, National Cancer Institute: Information and resources for Americans exposed to I-131 (a form of radioactive iodine) through fallout from above-ground nuclear testing in the 1950s and early '60s. Study Estimating Thyroid Doses of I-131 Received by Americans From Nevada Atmospheric Nuclear Bomb Test. Fallout from Nuclear Weapons Tests and Cancer Risks: Exposures 50 years ago still have health implications today that will continue into the future. / Steven L. Simon, André Bouville and Charles E. Land A reprint from American Scientist, the magazine of Sigma Xi, The Scientific Research Society. 'Performing your original search, iodine in nuclear weapons tests, in PubMed will retrieve 19 records. Thyroid disease associated with exposure to the Nevada nuclear weapons test site radiation: a reevaluation based on corrected dosimetry and examination data. Lyon JL, Alder SC, Stone MB, Scholl A, Reading JC, Holubkov R, Sheng X, White GL Jr, Hegmann KT, Anspaugh L, Hoffman FO, Simon SL, Thomas B, Carroll R, Meikle AW.